Apple presented their new MacBooks with a Touch Bar, which has been viewed as a trick by many, yet well, it can do some exceptionally cool things. A standout amongst the most remarkable features of the Touch Bar is the Control Strip, which essentially gives the user access to fast toggles for controlling different settings. 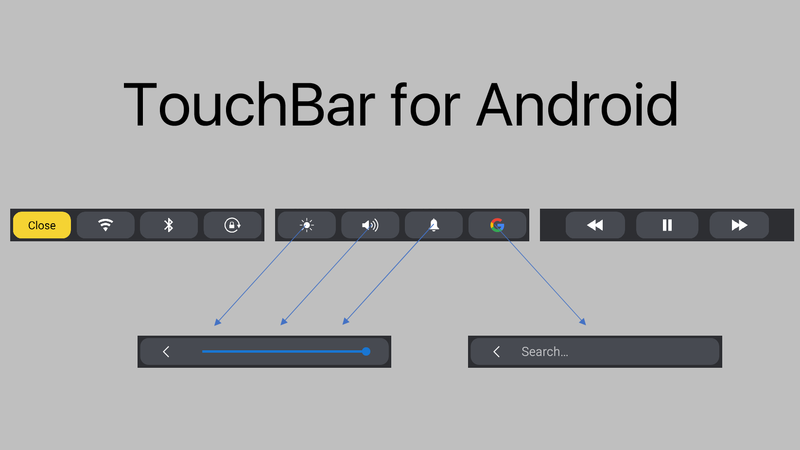 XDA Developer alecot18, has developed an app dubbed TouchBar for Android, which is similar to Touch Bar’s Control Strip on Android devices. Also, TouchBar integrate a Google Search button (on long click opens Google App) and a text field for quick search on single click and Music Controls (Previous, Pause and Next) UPDATE: from 1.2 Alpha Version 2 you can choose preferred payer between Stock/Play Music or Spotify. TouchBar appears with a swipe from the bottom UPDATE: from 1.2 Alpha Version 2 you can choose handle height and disappear when you touch outside of it UPDATE: from 1.2 Alpha Version you can also swipe down from the handle to hide it, but you can control delay with which this operation must take place. Its also lightly customizable as for now, but in the next future I hope to improve settings! This TouchBar app is completely free and doesn’t require root access. 1. Enable installation of third-party apps. Head over to the Android Settings and tap on the “Security” option. Once there, make sure the “Unknown Sources” option is checked. 2. Download the “TouchBar for Android” app and install it. 3. After installing the app, make sure to grant it all the permissions (Screen Overlay, Write System Settings and Do Not Disturb Access). 4. Tap on “Activate TouchBar” to activate the Touch Bar. 5. Now tap on the bottom region of your screen (above the navigation bar) to display the Touch Bar and interact with it. The TouchBar app for Android allows you to change your WiFi, Bluetooth, Screen Rotation, Brightness and Sound settings. The app also allows you to control your music with on-screen buttons.